Deutsche Bank says solar could be at grid parity in most global markets within two years. It predicts the US market will soar to 16GW a year, solar costs will continue to fall and the slump in oil prices will have a negligible impact on solar’s march. In his 2015 solar outlook, leading analyst Vishal Shah says solar will be at grid parity in most of the world by the end of 2017. That’s because grid-based electricity prices are rising across the world, and solar costs are still falling. Shah predicts solar module costs will fall another 40 per cent over the next four to five years. Even if electricity prices remain stable – two thirds of the world will find solar to be cheaper than their current conventional energy supply. If electricity costs rise by around 3 per cent a year, then Deutsche’s “Blue sky” scenario is for 80 per cent of countries to be at grid parity for solar. “We believe the trend is clear: grid parity without subsidies is already here, increasing parity will occur, and solar penetration rates are set to ramp worldwide,” Shah notes. And while short term policy fluctuations and uncertainty – in particular in Japan and UK – have caused it to revise down total uptake in 2014 and 2015, Deutsche Bank says demand for solar in the world’s two biggest economies is about to “take off”. Shah downplays the impact of the oil price slump, noting that oil account for just 5% of global electricity production – and barely registers in the most important solar markets such as US and China. In addition, even at prices of $US50/barrel, oil still cannot compete with solar. This fits in with the recent decision by European giant E.ON to dump its conventional electricity business and focus instead on distributed generation, for leading US generator NRG to also focus on solar and storage, and for Australian utilities such as AGL Energy and Origin Energy to roll out leasing programs. Some utilities argue that solar installations do not pay enough to support the grid, because transmission and distribution charges are generally based on metered electricity use. When a solar installation connects to the grid, it generates a portion of the owners electricity use and effectively acts as a reduction in grid demand. In most cases, this leads to a proportional decrease in the dollar charge for grid-sourced electricity (which includes a proportional charge for T&D cost recovery). Long term, we believe the business models for solar and utility companies will necessarily shift as grid penetration rates increase (currently no more than 1- 2% in even the high penetration states). Grid access charges could increase, utilities may start to compete more directly with solar installers, and cost recovery mechanisms generally will go through a rigorous analysis in most major solar markets. Another advantage of solar, as I understand it, is that it keeps the voltage up at the ends of the grid, decreasing the amount of power wasted keeping the voltage within specification. Very true the amount of power lost in transmission by Ergon is from 8% in zone 1 to 12% zone 2 and a huge 45% or more loss in zone 3. Because of these losses the company is more than happy to see DE installations in this zone. However it is trying to implement a high fee for supply agreement and shift to KvA charge method. This is all about stoping the use of Solar and is detrimental to the use of Solar. Some states in the USA have got a charge fee to connect to the grid to pay for poles and wires. I expect simular actions here all aimed at protecting the existing business plan. There should be charges assessed to residential users of solar if they wish to have the grid as a backup in case the sun stops shining (say it rains for a week). If you don’t want to pay the fee, unplug from the grid. Cool, you want to charge for the benefits of being connected to the grid, then pay for the benefit to the grid and everyone would be happy. Right now it’s a one way street in many places, where you don’t even get a cent for the electricity you deliver. When Investment banks, like Deutsche Bank, sign “All-In” hard dollar contracts with damages for non performance, in the hundreds of billions range, I will believe in grid parity solar energy. Engineers commonly go through an entire career, buried in happy predictions that in five years some killer app will conquer the world. At the end of a lengthy career, the technology is still only five years away. Nat gas is about $2.85/MMBTU, on a 24-7 basis. This article gets a question mark placed next to it. Dude, Hundreds of billions of dollars? How bloody big is your roof? Grid parity solar means it is competitive enough to be used on the grid. Hundreds of billions is a ball park for significant market penetration by any energy technology. It could easily break Deutsche Bank if they get it wrong. My roof size is irrelevant. If i put solar on my roof, my cost of power is half what i can buy it at from the grid. This is the same for millions of people almost world wide. How is that not competitive? Why do you need some obscure target for your belief? I spent decades engineering power plants, and use the definitions of that industry. What you discuss, panels on your roof, is distributed generation (the juice is made by you). But what happens when it snows, frosts, under clouds, night time, or in dust storms. Do you do without? Or tie into the grid? If you tie in there are a zillion costs which you have not recognized. One example: when the cloud blows away, your system may kill a lineman miles away, due to back feed on an open circuit (he thought it was shut off). There are required safety systems and power load reserve costs which must be added to your bill. Plus taxes. The “All In” sum will be greater than competitive technologies, carbon based, or uranium. Solar will find a market, but not for base loaded supply in the US. Its market may well be intermittent service to remote places in the developing world for communication. Selling your product directly, skipping the layers of middle men, with a phone that works one hour per day, is revolutionizing poor societies. My belief is lowest cost supply to the masses. No one in Washington D.C. cares about this. You know that the article was about distributed generation. Which is why i asked how big your roof was. The article is titled, Solar at grid parity in most of world by 2017. There are three basic concepts: time, money, and technology. One key concept relative to distributed generation is stand alone, vs. grid tied (These are different levels of service, with differing cost structures.) The All In costs must consider that fraction of grid tied supply created by subsidies, mandated purchases, and guaranteed reserves. Some body must pay the cost in full. For the rest of us, Solar at grid parity means that the cost of solar is at or below the price of electricity from the grid. For me, unsubsidised, it is half the cost. But for some obscure reason you require a single entity to spend hundreds of billions for you to believe this. I frankly don’t care what you believe. If your system was built recently in the USA, it was heavily subsidized by the the American Recovery and Reinvestment Act of 2009. You do not pay for the full cost. The public subsidies for solar power basically ended in 2014. By 2019 the U.S. Energy Information Administration (EIA) forecasts the levelized cost of natural gas electricity will still be less than half the cost of solar panels. If utilities that once promoted net metering can charge a grid usage fee, which they are actively seeking, the imbalanced costs will skyrocket. 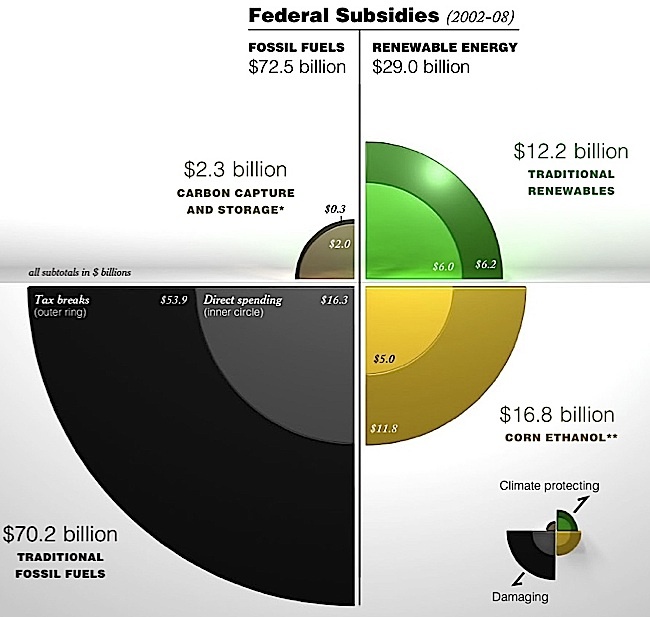 I am quick to acknowledge that subsidies are shot through the entire energy industry, so relative comparisons lose rigor; the differences rely on ideological positions, particularly climate change. Nevertheless solar is very expensive for base loaded supply, primarily due to dispatchability and capacity factors (some combine these.). With our national debt, we dump costs on my grand kids, roughly $60,000 per child. Their life will be one of poverty paying for Congress’s screw ups. That is what I care about. screw ups. That is what I care about. *) if you don’t get this you have no idea how the financial system works and come to false conclusions about everything else. But fear not, you’re not alone in this..
We don’t even have a congress. We can buy totally unsubsidised solar, even paying import duties and taxes and it’s still half the price. Throwing in the national debt argument is unrelated and non sensical. Renewable subsidies are a pittance compared to all the other subsidies given and would be lost in the rounding of the national debt. Your grandkids will be paying a much higher cost if the worst impacts of climate change aren’t mitigated. But, let me guess, you don’t believe in that nonsense either, do ya? At our present state of knowledge, we are faced with a existential issue without a firm basis of decision. I am not qualified to judge the risks of climate change. There maybe perhaps 200 experts worldwide on this science. From my back ground, energy engineering, I am certain that if mankind cuts back on carbon combustion to the degree that our mass and energy balance calculations show is needed, then billions will die. Energy supports life; lack of it kills. Carbon combustion is the source of some 90% of mankind’s energy. The reason? It is cheap and ubiquitous. Its only competitor is uranium fission, in limited applications. The social conflicts any significant cutback will create dwarfs, in scale, any war ever fought. If the worst case scenarios are correct, my grand kids will never reach maturity. Their lot is starvation or war. The political and technical management of climate change is the greatest evil man has ever suffered. Fools infest our science, and government. I don’t believe you, rlhailssrpe. Provide some evidence to prove your claim to fame or admit you lied. In a “reasoned reply” to a retired professional you simply accuse him of lying and ask that he spend his own time providing you with stuff that you already said that you don’t believe. If one actually wants to know the truth it is readily researched. Google how much solar panels cost, the amount of electricity they provide and the cost of hooking up to the grid to use “back up power” when it is night time. Plug the numbers into a spreadsheet. If you can not use a spreadsheet than you have already made a strong statement about the worth of your statements of knowledge. Intelligent people try to discuss using ‘facts’. The first person anyone needs to convince of the truth is ourselves. If we do not like the results than we can do more research to show ourselves what the data actually says. Accusations of dishonesty are quite valuable if there is false information being presented. Accusations of dishonesty made because we do not like the answer are not only public lies but a huge finger pointing to where we do not want it to point. which must be added to your bill. Plus taxes. The “All In” sum will be greater than competitive technologies, carbon based, or uranium. Dude, you have so no clue..
NO pv inverter that is allowed to be connected to the grid will deliver power when there is no grid at it’s output (that’s in the wiring-code all over the world). There are no linesmen in danger. If the inverter does put out power without the grid it’s a faulty one. Also linesmen do connect earth to the wire they work on so they are safe. PS: my inverters are hybrid ones that have battery back up option and if the grid is not there they will still be able to drive my appliances and there will be no power to the grid at any time (I even have a zero-export liability by the grid operator, so even if the grid could take my PV I’m not allowed to feed any..). And no, they were not much more expensive than standard grid-connect inverters without the battery back up option. I am aware of code requirements and know linemen practices. See my cost responses elsewhere. If you’re aware of the falsehood of this, why field it as argument? And as for your cost responses elsewhere.. solar and wind get less subsidies than fossil fuel, we waded through the numbers several times on this website, you can’t win a pot with that argument here either. I understand you work in the industry and might fear for your future, but posting rubbish arguments before people who did check the numbers won’t help you at all. What numbers do you factor in for global warming and ocean acidification? If carbon combustion is a real and present danger to mankind, there is no answer except poverty and death. The sole cost effective means of sustaining an advanced standard of living, is carbon combustion and uranium fission. You touch on the essence of our energy policy conundrum. Oh, now we see where you’re coming from. Thanks for clearing that up. This is a statement of belief, not objective fact. Certainly you must recognize that. Current trends in both renewable power and electric vehicles leave little doubt that we will de-carbonize the light duty transportation sector. It is the lowest cost option already. A used Nissan Leaf can be bought for $15,000. A new one can be leased for $200/month. A 5kW PV array at 10% capacity factor would provide over 12,000 miles of yearly driving. It would likely do so for 25 years. The car fleet turns over every 20 years, so this is a matter of pace, not probability. The more difficult de-carbonization problem is buildings. New net-zero homes can already be built at a lower monthly cost of ownership than the standard issue utility dependent model, but it will take many years to re-skill and educate the building trades, and retrofit of existing stock is difficult and costly. On the happy side, solar PV peak output coincides with peak A/C load. I don’t doubt your expertise in the power industry, but to seemingly advocate for fossil and fissile fuels while vilifying government and deficit spending is, from my perspective, nonsensical. Ensuring access to petroleum resources for the U.S. requires massive military support. Nuclear power requires permanent government subsidy, vast regulatory bureaucracy, and cannot be de-militarized. And finally, there is no more profound form of deficit spending than creating waste materials that are toxic to all life for thousands of years to produce a commodity that we consume instantly. Your grandchildren, and their grandchildren’s grandchildren will carry the burden of nuclear waste we produced. Its toxicity will remain long after the United States, and all other nations, have ceased to exist as political entities, and perhaps even longer than we will persist as a species. All for want of an electron that long ago did its useful work. Review the cards. The massive subsidies for solar power just ended in 2014, in the US. With the Republican Congress they will not be renewed. China burns four times as much coal as the US, much of it comes from either internal sources or Australia. The policy of both nations, plus Japan and South Korea is to greatly increase this commerce. India is developing her meager low grade sources. Not withstanding the UN IPCC annual, fruitless conferences, If you read the fine print, there is no commitment, from any industrialized nation to severely cut back or stop coal combustion. Russia and OPEC survive off carbon fuels (and Putin’s Russia has 27,000 H bombs). The reason for the collapse of crude oil prices is a gross imbalance of supply to lower demand. The world is awash with crude oil, yet it supports national economies. Fracking has made the US, again, a major hydrocarbon producer. It has driven Nat gas to below break even costs, circa $2.80/MMBTU. This undercut all alternate energies on a competitive cost basis. I see no realistic path for any major nation to stem the ever expanding use of carbon combustion, particularly burning of cheap coal. Germany tried, experienced spiking energy costs and fired up her old coal plants. After Fukushima, Japan shut down her nukes and experienced the same cost spike. Hence, if you accept that carbon combustion, CO2 emissions, cause a near and present danger to mankind (I doubt it but this is not my expertise), humanity will go over the cliff, in this century. This would be true if the USA ceased to exist, as we know it. I see no real political leadership, in the US, to confront this survival threat. It dwarfs all of our war efforts. There is no bright green tomorrow, based on peaceful competition. Full disclosure: I do not now, or ever had significant income from any primary fuel industry, other than employment as an engineer. I engineered a score of nukes, two score carbon fueled power plants and spent decades assessing advanced technologies, mostly in energy related fields. I am retired. Your original “sole means” statement basically said it ‘can’t be done’. Your reply to my comment basically says that it “won’t be done”. You may well be right about that. Ten years ago I saw no hope whatsoever. Now, although not yet optimistic, I see encouraging trends. Time will tell. In my opinion, it is too early to declare the German Energiewende a failure. They are committed to the transition, and I believe they will ultimately prove to be successful. If and when they are, considering their economic and manufacturing status, it will powerfully (ha!) demonstrate that those that claim that modern industrial economies can only be run on fossil and nuclear power, are mistaken. I also agree with you on your ‘Deutsche Bank’ comment. Although I’m not familiar with the particular contractual loan contingencies you cite. The volume of investment capital into renewable energy is a meaningful proxy for gauging the efficacy of the technology, and global investment is shifting to renewable energy. This will continue and grow. What would a successful transition from fossil fuels to renewables look like in the beginning? In my opinion, it would look exactly like what is happening now. All of the trend lines look very promising. The tide is beginning to shift (and be harnessed, hello Scotland). I no longer think that peak oil is the most significant threat to long term human well being. The petroleum tail will be very long. All things considered, we already power the global transportation system with coal and methane, we just do it in a very complicated way involving petroleum extraction and refinement and very inefficient combustion engines. Converting transport to electric drives will allow us to bypass the petrol step. Personally, I won’t miss the noise. I now consider global ecological collapse as the largest existential threat. And yes, I do accept that human activities are changing the climate and acidifying the oceans. Seems pretty straight forward to me. Regardless, fossil fuels are finite. We have to transition to an alternative eventually, so aren’t we better off doing it while fossil stocks are still cheap and abundant and we are relatively rich? We have communicated. From my background, engineering, abandoning carbon combustion can not be done, and will not be done, as poverty is the certain result. The central problem can be reduced to cost (excluding war). The alternate energies, now, and for generations, will be too expensive for mass use. Governments can, and do, change the competition by larding on regulatory costs on the “bad” technologies and pouring money and favors on the “good” technologies. Being human, ultimately the cash flows into the pockets of certain buddies, with little valid assessment of the relative benefits and costs. Over time, it is inevitable that costs rise until marginal industries shut on, move off shore, and chronic unemployment/ under employment becomes the norm. This is America today. The government killed the nuclear and coal power industries decades ago. We lack two generations of experienced power engineers. We import engineers from Asia, and today, our infrastructure would collapse without their industry and talent. Engineers focus on technology. Banks focus on money and are highly sensitive to government gravy. In the US, the gravy has been poured on the green energies, with gargantuan direct costs. Government costs, war, poverty, etc. are purposefully confused by politicians, who coin “clean”, “external” benefits or costs to suit their purpose. My definition of cost is your light bill. As noted elsewhere, the government has transferred that debt to our children, pushing lousy technologies. When the gravy stops, all investment banks will drop alternate energies. This energy decision is inevitable, but has been obfuscated for decades. I have worked on equipment which supports our grid which was installed in Thomas Edison’s time. There are technical reasons why it is preferred over solar generation. I agree that this life or death decision has not been made. Currently Europe, or Japan currently will face it before the US. Both economies are suffering from their energy decisions. The developing nations are ignoring the conflict between carbon combustion and the climate; they are forging ahead seeking cheap energy. Cost effective carbon fuel extraction will last for ??? generations or centuries (as long as forecasters can assess). If climate assessments are correct, carbon scarcity will not be a factor, IE, we will kill ourselves off before we run out of poison. Converting our mobile fleet energy to electric supply, a man made commodity, will only accelerate the problem. America has bad terrible energy decisions and has run out of time. Blame Sam Rayburn and Senator Lyndon Johnson for funneling money to their Texas oilmen backers if it makes you feel better but stay in reality for the sake of America. Thank you: I am out of time. Yes, I’m out of time for a pointless exchange of subjective opinion also. Your statement that: “The alternate energies, now, and for generations, will be too expensive for mass use.”, is simply not correct. A new net zero solar home in conjunction with an electric car, has a lower monthly cost of ownership than a standard fossil fueled new home + combustion car, Today. Right now. It is being done, and it will become cheaper to do so over time. I’ve no reason to doubt that you are a highly competent engineer. Perhaps you should revisit your assumptions. Fossil fuels are only cheaper if you completely ignore all of their externalized costs. We concur that externalized costs, and their consequences. are the deciding issue. You look at the average cost of generating electricity which is not the whole story, if you look at the cost of peaking power in on the hottest summers (when solar output is greatest) solar wins now. Also, if you want to include the zillions of other costs for solar, you need to include theme for the fossil fuel industry, like oil spill clean up, deaths from coal mining, contaminated water supplies, destroyed streams from acid runoff. rlhailssrpe, you may have spent decades working on power plants, but clearly your knowledge is decades old. While it’s true that the poster did not recognise the cost of the grid, your old “base load’ chestnut is no better. The whole point of solar parity is that it is a domino effect as prices fall and economics charge across whole markets. As this happens, and then the gap widens even further, there will be an enormous economic incentive to make do with as much solar as possible. Your “base load” issue is old thinking that is in the process of being solved and will become less of an issue, some over the next few years, and some over few decades. In particular, being in the US you may well be unaware of many things that are going on in countries like Australia where the economics are very different. Such domino effects are starting all over the world – already solar has an enormous penetration in Australia and all these things will be in the US very soon. – more grid storage technologies are being explored and coming online all the time and they will ramp up over time. as the solar to fossil gap widens they will quickly become more economical. – and finally it is not an either/or thing. it IS likely that fossil fuels will have a part to play for a few decades yet, but they will see vastly reduced usage and will increasingly get relegated to peaking power plants to manage load until all the newer technologies come online in the next few decades. The real question is whether fossil fuel plants will disappear by natural attrition, or whether they will go bankrupt and get demolished. I rather suspect it will be the latter in many cases, depending on age and local conditions of course. And one would certainly have to absolutely have rocks in one’s head to build a new fossil fuel plant at this stage. There’s just little to no chance of it hanging around for long enough to get a decent RoI. What you envision does not exist. My “old school thinking” the base load, keeps you alive. If America does not slide into dictatorship, due to energy, e.g. government control of your air conditioner in August – smart demand management, does not mandate and subsidize green energy, permits private investment, then the market will decide what energy is cost effective. When Bush was President hundreds of coal fired power plant applications were submitted to the government. When Obama became President they were all cancelled. If you consider energy globally, some 90% of electricity is made from carbon combustion (Asia burns more than four times the amount of coal than America and the fraction is increasing). Germany shut down its nukes and as a result is burning more lignite, a lousy native coal. I have studied most of what you mention and the assessed result is normally higher costs at the same level of service. I fear your vision of the future for our nation. If I’m reading that graph correctly, it has the US listed at $.20 per kWh (is this wholesale?). If so, someone might want to take the author of this article out of the sun…at those prices it will be a LONG time before solar reaches grid parity. Oh look. It’s another big oil whore apologizer who doesn’t give a hoot about the planet or what kind of world he leaves for his children. Get it through your head.. the big oil era is over and the era of the sun is just getting started. The guy asked a question, you replied with an accusation and an insult. A little man on a comment board. No wonder we can’t have decent discussions anymore. Show your kids what you wrote, I’ll bet they would be proud. I share your annoyance with the poster’s ad hominem attack but no need to lower yourself to his level to get your point across. Australia at 50c(US)/kWh? Yes at peak hour but not for the majority of tariffs. While taken from a Deuche Bank graph it does present a rather unrealistically rosy picture. I read US as 18c for grid and 17c for solar. By Deuche Bank figures it is at better than parity. it is for Hawaii only, which has the highest cost of the states. Your added comment about the author was an ad hominem attack and invited other ad hominem attacks. (in case you need a refresher on the term: http://en.wikipedia.org/wiki/Ad_hominem). Just wondering, is there a policy on this type of posting? If so is there anyone to enforce it? Exponentiation growth, next year it will be $.10 and the year after $.05, cheaper then coal. owns the sun or its energy are what make it inevitable. Let’s say you are considering buying a solar panel system that will save $1000/yr in energy costs. However, the installed price of that system is expected to drop $1100 next year. You are better off waiting until next year and then re-evaluating your options. I have seen no online discussions of this. But it’s like any new technology. Early adopters get to enjoy telling everyone about their new gizmo; the masses get it when it’s established and cost-efficient and the late adopters get it at their kids insistence.